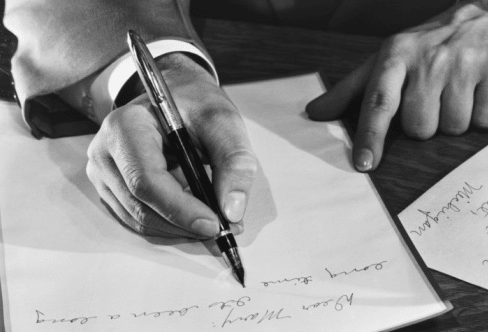 Taking a break from click-clacking away at one’s keyboard to write something out by hand — a thank you note, a journal entry, a page of copywork — is a uniquely pleasurable activity. And there are a few things one can do to heighten this pleasure, and its feeling of ritual. One is applying your writing utensil to a handsome journal or quality stationery. Another is improving your handwriting. It makes you feel like a sir. 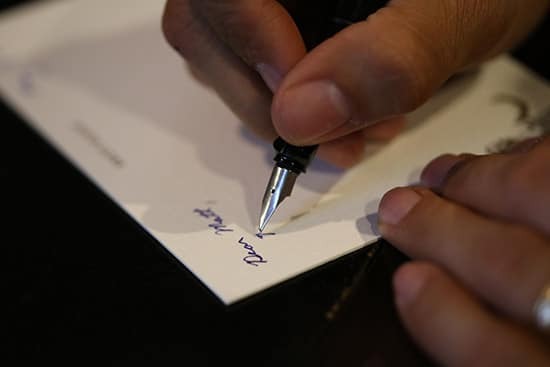 I’ll admit it — one of the appeals of writing with a fountain pen is that it just makes you feel awesome. 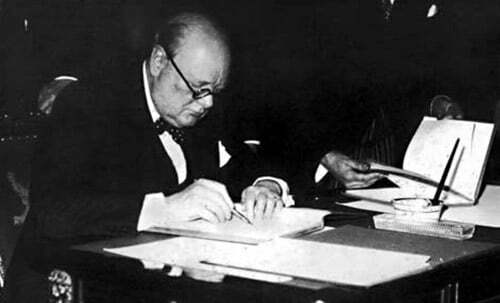 There’s something about writing with the same implement that Teddy Roosevelt and Winston Churchill used that makes you feel like a true gentleman and scholar. 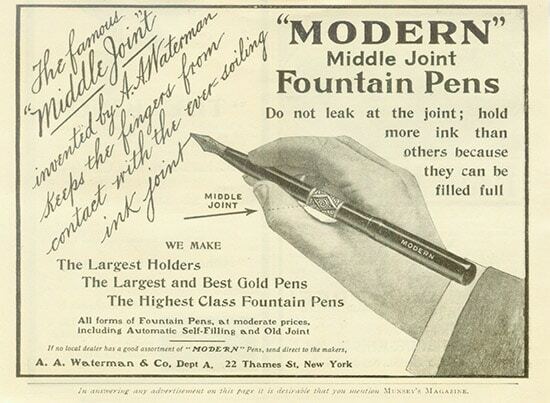 The fountain pen’s design is sophisticatedly simple. 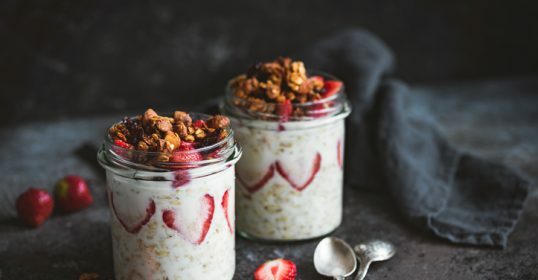 It consists of three main parts: the nib, the feed, and the filling system. Part of the feed hugging the bottom of the nib. 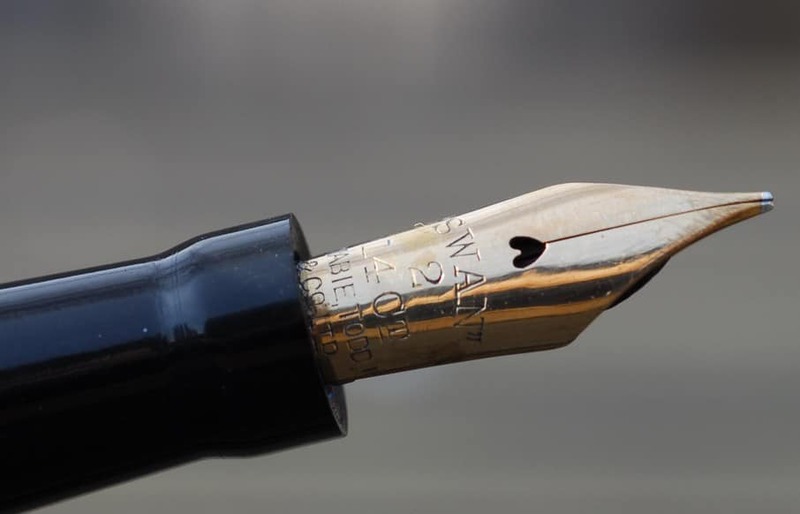 The feed is the piece of black plastic (or ebonite on antique pens) that hugs the bottom of the nib. It might not look like it, but the feed is the most important part of a fountain pen. It provides the route by which ink travels from the reservoir to the nib, and by which air fills the reservoir. 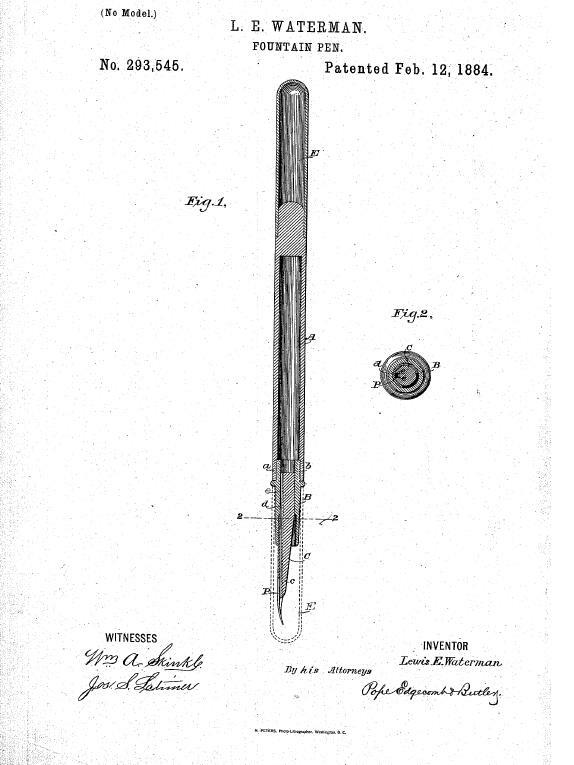 Ever since Waterman patented his feed design in 1884, pen makers have strived to create better and more efficient feeds. 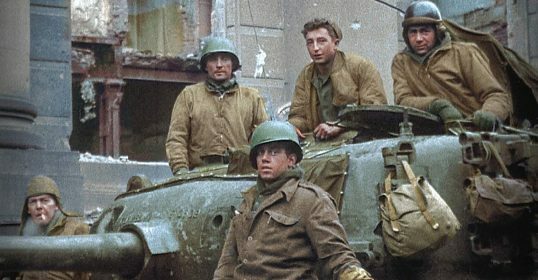 In 1941, the Parker Company introduced one of the most notable upgrades by adding a “collector” to the feed. 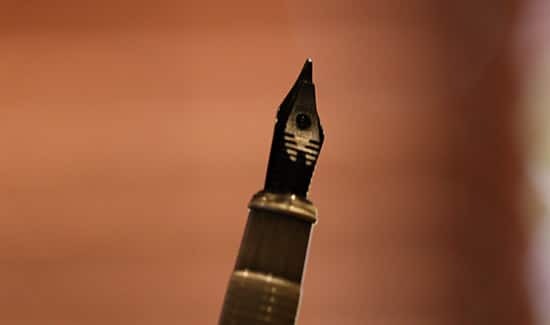 On modern fountain pens, the collector is a visible set of grooves or fins just beneath the nib. 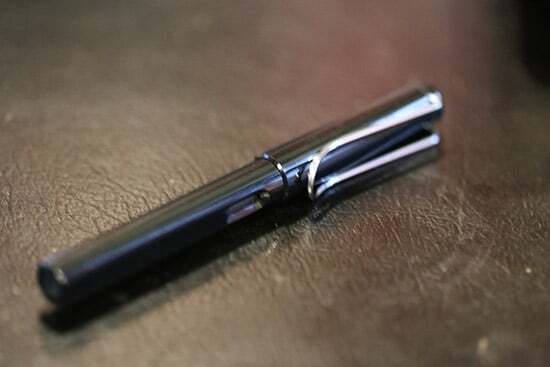 The collector acts as a second reservoir and keeps the nib well supplied with ink while also preventing too much ink from flowing out at once. Piston. 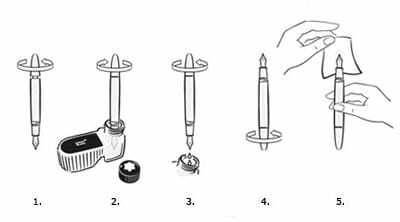 This filling system relies on a screw mechanism that draws a piston up the barrel, sucking in ink through the nib and into the reservoir. It’s basically a built-in converter. 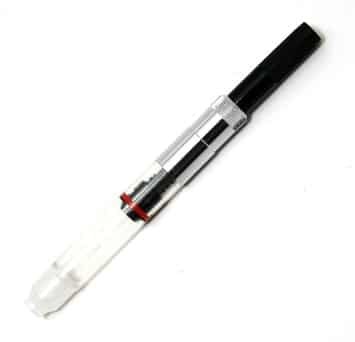 The only downside (if you can call it a downside) on a pen with a piston filling mechanism, is that you’ll never be able to use cartridges with it. You have to fill it up manually every single time. Here’s how to fill a piston style pen. 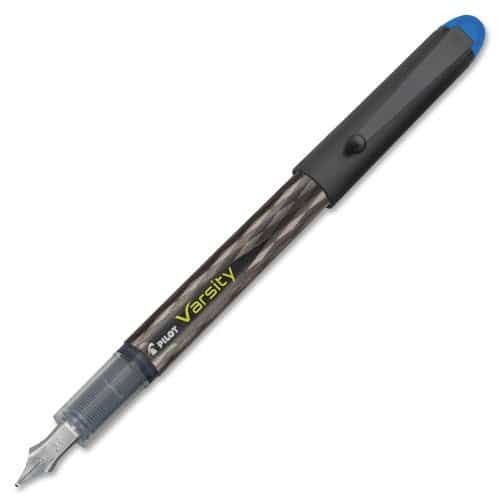 Varsity Fountain Pen by Pilot. 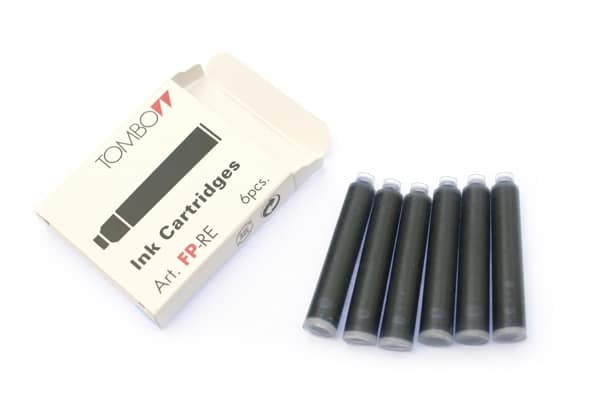 These are disposable, so you’re not going to get the “true” fountain pen experience with them. But at $8 for a pack of three, it’s a great way to give fountain pens a try without much investment. The big downside I’ve found is that the ink feathers on most types of paper, causing my handwriting to sometimes become less legible. Lamy Safari. After lurking on several fountain pen forums and polling the aficionados among my Twitter followers, it became clear that the Lamy Safari was hands down the most recommend fountain pen for beginners. With a ~$20 price tag, it’s a great reusable/refillable fountain pen for the man just getting started. Pilot Metropolitan. 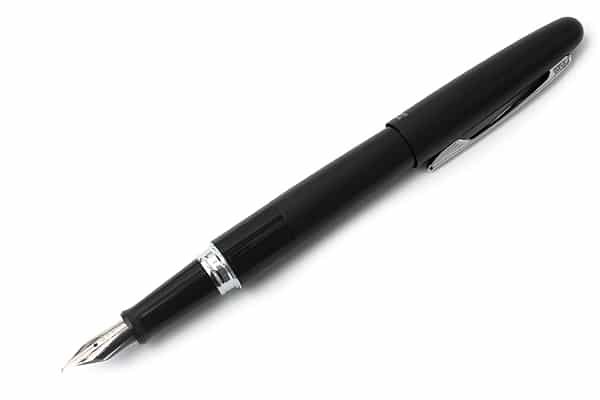 Right behind the chorus of recommendations for the Lamy Safari was the Pilot Metropolitan. It’s a sharp looking pen that writes well and costs a mere $15. Always keep your pen’s cap on when not in use. Keep the cap on when the pen is not in use. This prevents the ink on your nib from drying up and protects the nib from damage. If you do happen to leave your pen uncapped and find that the ink has dried up, you’ll need to remove the dried ink that’s blocking the flow. Soaking the nib with water can often do the trick. 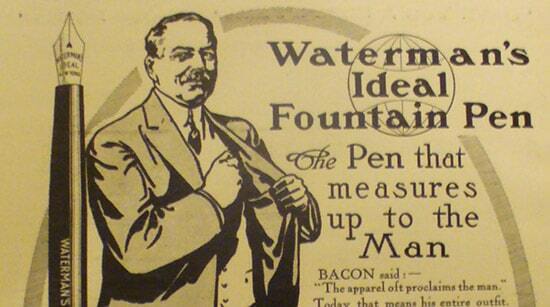 If that doesn’t work, consider doing a complete flush of your pen — repeatedly filling it and emptying it with cool water. 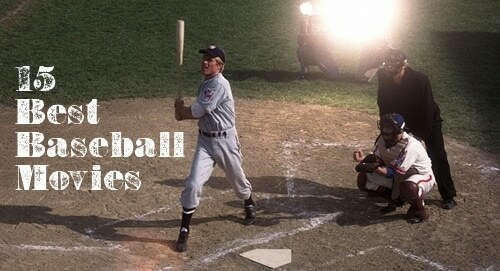 Richardspens.com. This is THE source on fountain pens on the web. I spent hours just reading through the in-depth articles he has on every aspect of fountain pens. 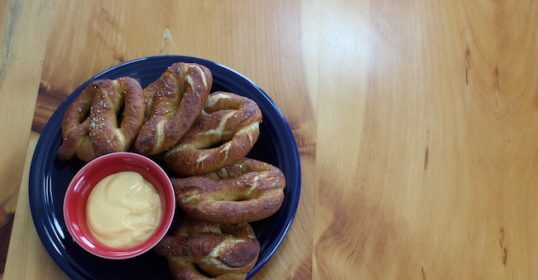 This site is a must-read for anyone wanting to learn more about them. The Fountain Pen Network. A forum dedicated to fountain pens. The folks there are super helpful with beginners, so if you have a question, ask. 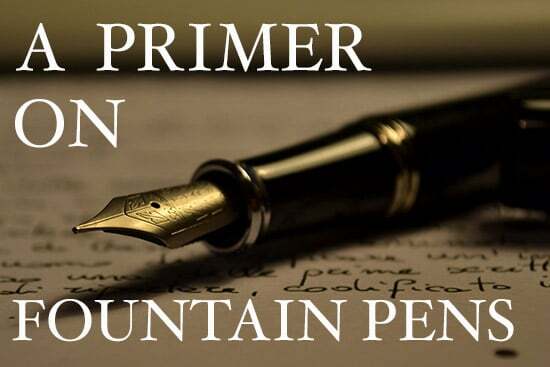 They also have lists of groups, meetings and events dedicated to fountain penning (yeah, I just used fountain pen as a verb), as well as a marketplace where you can buy or trade new fountain pens. Fountain Pen Board. A smaller, more tight-knit forum than Fountain Pen Network. 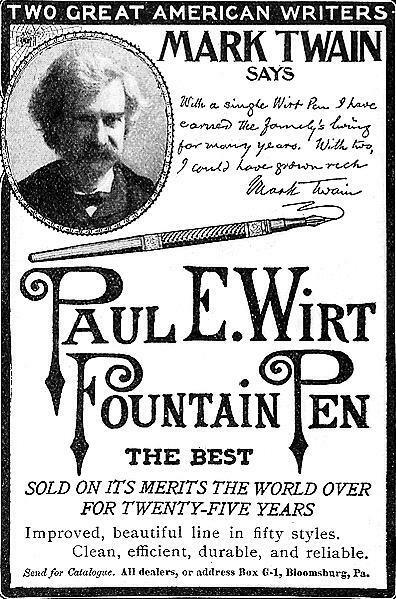 Ask questions or buy or sell your antique fountain pens.